With out of the box configuration, including workflows, forms and reports, the latest features in KineMatik QMS Applications for Content Suite now provide graphical tools for easier configuration of Form views and the QMS Applications Interface. Provide your customers with the ‘How to’ guidance and hands-on expertise needed to configure, plan, and integrate effectively the KineMatik QMS applications into their business processes. KineMatik QMS is a suite of applications that facilitates an organisation in managing their Quality Processes within Content Suite using out of the box configuration of workflows, forms and reports presented via a concise and intuitive application interface. The latest version of KineMatik QMS provides graphical tools for easier configuration of Workflow Form views and the QMS Applications Interface. Use the KineMatik Quality Management applications and your product knowledge and expertise to enable rapid deployment and configuration, based on best practices. Register HERE for this webinar and understand the opportunity in selling the latest version of the KineMatik Suite of QMS Applications 3.0 for Content Suite. Enabling form view sidebar widgets e.g. attachments, comments and timelines. These features provide advanced controls for QMS form views. During this webinar, see how the new features can be used to build new form views, edit existing views and reconfigure the registration page columns allowing you to work closely with your customers to deploy and configure their quality processes. With out of the box configuration, including workflows, forms and reports, the latest features in KineMatik QMS Applications for Content Suite now provide graphical tools for easier configuration of Form views and the QMS Applications Interface, saving you days and weeks of configuration work and providing you with the tools to swiftly configure the Apps to your quality process. Register HERE for this webinar and see the value you can get from using the latest version of the KineMatik Suite of QMS Applications 3.0 for Content Suite. During this webinar, see how the new features can be used to build new form views, edit existing views and reconfigure the registration page columns saving time and money. Delaware becomes KineMatik Authorised Partner for the KineMatik range of OpenText Content Suite Solutions. Cork, Ireland, January 2018 – delaware has just been appointed as a KineMatik Authorised Partner further enhancing the delaware solution offering, to meet the needs of their customers. “We are delighted with this new partnership as delaware has an excellent reputation as a value add solutions and services Reseller, across all sectors. We believe that this Partnership will further grow our customer base creating a better way for organisations to work with information, whether it is on premise or in the cloud,” says Anne O’Leary, Executive Chairman, KineMatik. The manufacturing industry is facing new challenges everyday ranging from regulatory constraints, to volatile markets, increased customer expectations and competition. Manufacturing companies have increased opportunity to get ahead through optimising the use of technology, and become more productive and profitable. KineMatik Project Management for Content Suite is an advanced Project Management solution which enables organizations to integrate projects & project tasks with Enterprise documents/systems. 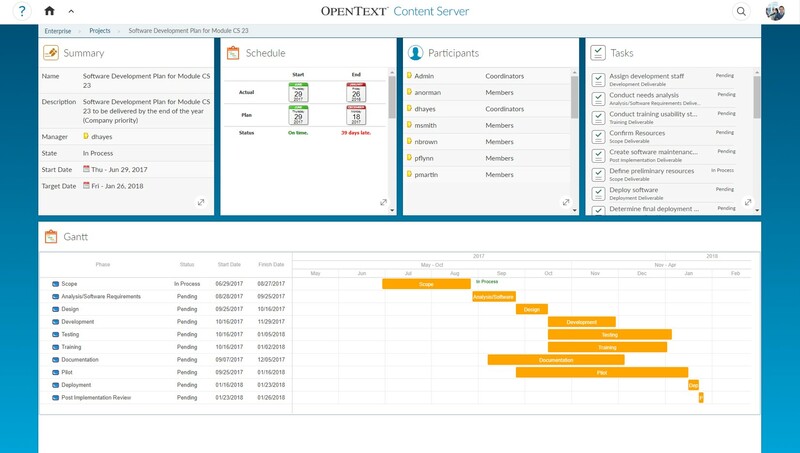 Register HERE for this webinar and see the value you can get from using KineMatik Project Management for Content Suite which also leverages the latest Smart UI for Content Suite 16 users. Also hear from the OpenText and KineMatik Project Management customer, the Canadian Institute of Health Research. Learn why they decided to use KineMatik Project Management and how they have saved considerable time and money.